16 When Jacob woke from his sleep, he thought to himself, The Lord is definitely in this place, but I didn’t know it. 17 He was terrified and thought, This sacred place is awesome. It’s none other than God’s house and the entrance to heaven. 18 After Jacob got up early in the morning, he took the stone that he had put near his head, set it up as a sacred pillar, and poured oil on the top of it. 19 He named that sacred place Bethel, though Luz was the city’s original name. I have been tasked with writing a lengthy (10,000 words) chapter for a book focusing on the cultural history of religion in the 18th century. It’s due the first of September, and I have only begun my research and writing. That chapter came to mind, as I read this story from Genesis 28. In this passage, we discover that Jacob has a dream in which he hears God reinforce the covenant made first with his grandparents, of which he is now the third-generation carrier. God has promised to bless Abraham and his descendants (Genesis 12). Now, God reaffirms that promise, telling Jacob that this land upon which he is lying, is given to him and his descendants. While his descendants will span out in all directions, they will always have this land as their inheritance, even as they serve as a blessing to the peoples of the earth. When Jacob woke up from this dream, he declared that Yahweh (the LORD) was definitely in this place. He recognized this place to be sacred (even if he didn’t at first recognize its sacredness). As we ponder this reading for the seventh Sunday of Pentecost, the author invites us to consider the spaces that are sacred because they are places where God is encountered. Most religions have designated certain sites/places as being sacred. Often these sites mark a special encounter with the divine, a place like Mount Sinai, Mecca, Golgotha. While there are significant pilgrimage sites that seem to speak powerfully of the divine, many of us understand the places we gather for worship to be sacred as well. We consecrate buildings, dedicating them to sacred use. They may cease to serve this purpose, but at least for a moment they are sacred. Indeed, even a high school gym can become sacred when used for sacred worship. When I was visiting England during my 2013 sabbatical, I found Christ Church Cathedral just such a place. It was a place where I felt close to God, especially during Evensong. More recently, during the Disciples General Assembly Cheryl and I worshiped in a small Indianapolis church where a friend was preaching. It definitely isn’t a pilgrimage site, but it was a place where I experienced a powerful sense of God’s presence. In this passage, Jacob is on a journey. He has received his father’s blessing (instead of Esau his brother). As was true with his father, he has been told that he is not to take a wife from among the Canaanites (his neighbors), but instead should go to the house of his mother’s brother, Laban, and find a wife among his daughters (Gen.28:1-5). As he traveled from Beer-sheba, in Canaan, toward Haran, he stops for the night at a place that to that point had not been understood to be sacred. However, because of Jacob’s encounter with God, it would become a sacred site. As he laid down to sleep, he took a stone, and put his head on it, and when he had gone to sleep, he had a dream. In that dream, he saw a ladder that linked heaven and earth, and traveling on that ladder were angels. Brueggemann suggests that what the author might have in mind wasn’t a conventional ladder, but a ramp that led up a Mesopotamian Ziggurat, connecting earth and heaven. In this picture, “heaven has to do with earth. And earth finally may count on the resources of heaven.” It is, a reminder to Jacob that he does not travel alone. As Brueggemann notes, “now it is asserted that earth is a place of possibility because it has not been and will not be cut off from the sustaining role of God” (Brueggemann, Genesis, p. 243). As he took in this sight, Yahweh stood next to him, and spoke to him concerning his calling to be a blessing to the nations. This is the key to the rest of the Genesis story. God has made a covenant with Abraham and his descendants, and God is committed to the covenant. Isaac was the first carrier. Jacob will be the next (remember he is on a journey to his uncle’s home to get a wife, with whom he can produce heirs). When he awakens, and reflects upon this encounter, he determines that this must be a sacred place. Remember that God declared that the land upon which he lay was his, and that his descendants would become like the dust of the earth, but the land would always be theirs, as a sign of God’s covenant. So, Jacob sets up the stone on which his head laid as a monument to this promise. He then named the place Bethel (House of God). It is important to note again that Jacob did not expect to encounter God in this space. It wasn’t, at least to that point, a major pilgrimage center. But then, isn’t that the way God works. God shatters our expectations and meets us in places and in moments we do not expect. With it comes a promise of protection and sustenance. God will be present. The word here connects us with the promise of Emmanuel, God with us. Place is connected with promise. As we reflect on Jacob’s encounter with God at Bethel, we are invited to consider those places that have become sacred to us, places where we have heard God’s promise and God’s call. I think back to the places in my own life that have, even if I didn’t recognize it at the time, a place of calling and promise. During my sabbatical a few years back, I made a pilgrimage to St. Luke’s of the Mountains, in La Crescenta. It was there that I was baptized (even if I don’t have any recollection of it at the time). I think about that small stone church in Dunsmuir, California, St. Barnabas Episcopal Church, where I had my first real taste of worship and service to the church. It was there, as an eight-year-old that I was invited to serve as an acolyte, assisting the priest in consecrating the eucharistic elements. I stopped by that site recently and took a picture. 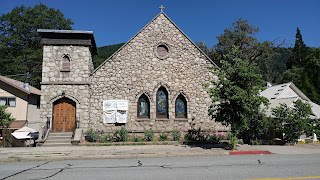 It’s no longer an Episcopal Church (the church moved to Mount Shasta), but it is a sacred site to me. St. Paul’s Episcopal Church in Klamath Falls is the place where I was confirmed, a place where I served as an acolyte, sang in the choir, and then served as a lay reader. Of course, there are other places that have been markers along the way, including Temple City Christian Church, where I was ordained into Christian ministry. Each of these sites, none of which are major pilgrimage sites, are places that mark my journey. What are the places that mark your spiritual journey? They might be sacred sites, such as a church, but perhaps not. They could be a place of exceptional natural beauty, a place like Crater Lake or Mount Shasta. Or they may be a spot in the road, where, like Jacob, you lie down and go to sleep with a stone as your pillow, and God visits. In Jacob’s case, when he awakens, and discovers that God has appeared to him in a place he did not expect. So he takes the stone, sets it up as a pillar, and then anoints it with oil, consecrating the site so that others might see and understand God’s covenant promise of blessing. For isn’t that purpose of our calling? To be a blessing to the peoples and to creation? 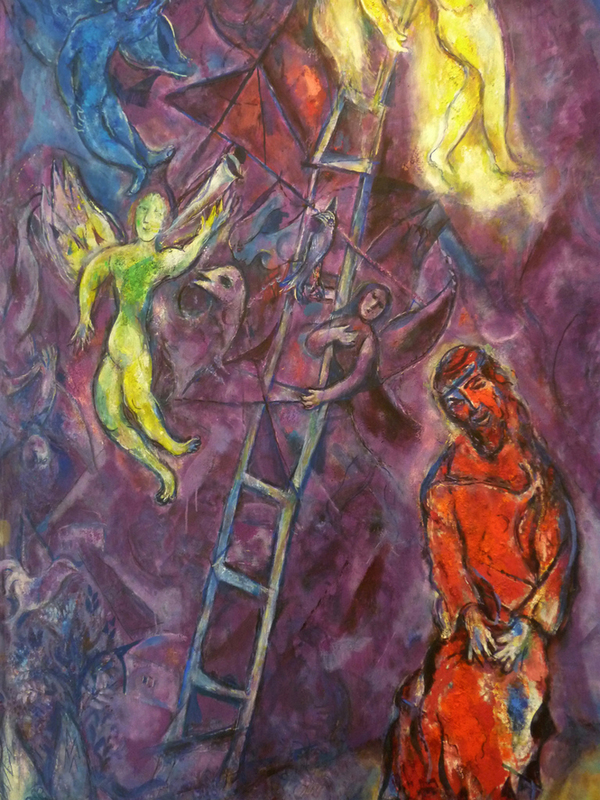 Picture Attribution: Chagall, Marc, 1887-1985. Jacob's Ladder, from Art in the Christian Tradition, a project of the Vanderbilt Divinity Library, Nashville, TN. http://diglib.library.vanderbilt.edu/act-imagelink.pl?RC=54657 [retrieved July 17, 2017]. Original source: http://www.flickr.com/photos/abeppu/3815924145/.